Within the US, among 22 ranking factors identified, social signals account for 5 of the 6 most highly correlated with Google search results, according to a June 2012 study from Searchmetrics. Presenting the correlations using Spearman’s rank correlation coefficient, the study shows that Facebook shares (0.37) have the highest correlation, followed by number of backlinks (0.36). Other high-ranking factors include Facebook comments (0.33) and likes (0.3), and Tweets (0.25). A number of factors display a negative correlation with Google rankings for automotive related websites, including title character length (-0.04) and the position of title keywords (-0.05). According to a BrightEdge survey released in January 2012, 84% of search marketers say social signals such as likes, tweets, a… will be either more important (53%) or much more important (31%) to their SEO this year as compared to 2011. Backlinks continue to be one of the most critical factors affecting rankings for car dealer and automotive related websites, according to the Searchmetrics report. The number of backlinks ranks just behind Facebook shares as the most highly-correlated factor. Additionally, other backlink factors also positively correlate, such as the proportion of nofollow links (0.15) and the proportion of links containing keywords (0.10). Further results from the report indicate that too much advertising by a car dealer, dealer association or an OEM can be a dampener on search ranking success. The advertising factors studied all returned a negative correlation: AdLinks; AdSense; and AdSense Blocks each had a correlation coefficient of -0.04. Even so, the report notes that the correlation value for Adlinks includes AdSense, and separating out AdSense, which has a negative correlation, yields a better result for Adlinks. Basically, not including AdSense code for Google Adwords to insert advertising on your automotive related website seems to have a positive correlation with ranking on that site’s SERP. Also, Searchmetrics indicates that this result needs to be monitored, as these factors only appear to be relevant in the top 10 results and because AdSense tends to feature more often on poorly ranking sites than those with better rankings. Strong automotive brands rank in the top 5 even without perfectly conforming on-page structures, adding weight to the presumption of brand power in search rankings. Keywords in automotive domain names correlate much more strongly with high rankings than keywords in the rest of the URL. Image count does not appear to be much of a factor, with a correlation coefficient of just 0.04. About the Data: The report cautions that correlation does not equate to causation, and these results do not in any way guarantee that the factors have an effect on rankings or are even used by Google as signals. For its dataset, Searchmetrics selected an extremely large keyword set of 10,000 search terms from Google.com U.S. Searchmetrics did not just include the top 10,000 search terms according to search volume, since they contain a disproportionately high number of brand keywords which might have distorted the assessment of many other key factors. Instead the reference dataset includes a mix of different keywords with, if not the largest, then at least generally high search volumes. Around 1 in 10 are keywords that were identified as navigation-oriented according to Searchmetrics logic; the rest are a mix of keywords from a variety of CPC areas to best cover transactional (higher CPC) and information oriented (lower CPC) searches as well as the hybrids in between. The assessment was limited to organic searches – AdWords, Universal Search OneBoxes, 2 to 7 packs, sitelinks, iGoogle integrations etc. were not included. The analysis’ 10,000 analyzed keywords lead to: 30,000 SERPs with 300,000 titles, descriptions and URLs. The ranking sites’ content included: 14.68 GB in data; 92,672 AdSense blocks; 338,562,612 Facebook comments; 3.04 billion shares; and 8.1 billion likes. Carrie and the entire AutoConnections Conference Team have been working at a feverish pitch over the last 48 hours on a mission of finding a bigger and better venue. 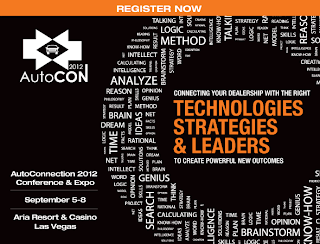 Many thanks to the sponsors and dealers who have enrolled over the past week and provided us with the revenue to upgrade the AutoCon 2012 venue to the fabulous $2 Billion facilities at City Center Las Vegas and the Aria Hotel. With the upgraded general session auditorium and state of the art stage, AutoCon will now be able to handle well over 500 attendees. This is VERY BIG NEWS and I could not be prouder or more thrilled with Carrie’s superb management of the upgraded facilities negotiation. The rooms at Aria where AutoCon 2012 attendees will be staying are AT LEAST twice as nice as those at the much older Mirage property… And thanks to Carrie’s negotiation skills, AutoCon attendees will be staying at the Aria for less than half the cost this property normally receives! A nicer hotel at a room rate less than most other conferences is yet another reason to attend AutoCon 2012 and gain the most significant strategic insights and competitive advantages in the auto industry.